Muktha Warrier was born in a small town of God’s own country, Kerala. Now put up in Delhi. A Post Graduate in science stream. (from Indore Engineering College). 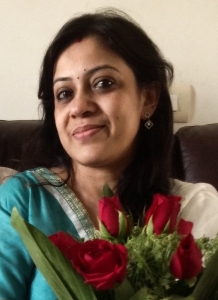 Did DAC from CDAC Pune; Worked as a software developer with a private firm in Pune and then as an editor with a publishing company in Pondicherry. Published some poems in a leading Malayalam weekly and some articles in various e-magazines. Daughter of Dr. K.B. Warrier (Kerala Govt. Astrologer) and Mayadevi (Retd. Joint Director of Panchayats). Married to Radhakrishnan (Vice President with TPG groups), and having a daughter Anagha. Unique because it’s my own real experience, with some miracles happened in my life, mixed with some fantasies. Getting a story or book published is a thing of joy for any writer; I’m not an exception. Writing is my passion. Though I keep writing; I may not be able to publish everything and so my writings may not reach many readers. So can’t predict anything whether I will be an accomplished writer. But one thing I can affirm is, I won’t quit writing, as it is in my blood, genes…like music.